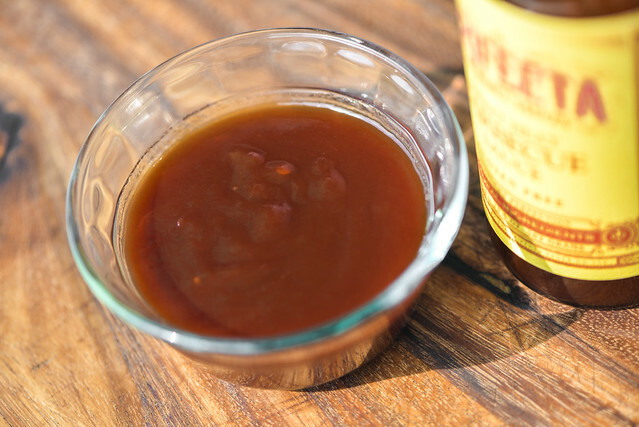 An exemplary ubiquitous barbecue sauce that builds layers of sweetness, tang, fruitiness, and heat against a very bright and clean base that makes it really stand out in crowded field of barbecue sauces. The good people with Trifecta Gourmet Sauces were kind enough to send me two bottles of barbecue sauces and a marinade not once, but twice after my local post office lost the first package. Trifecta was born out of necessity when creator Matt Trimpe ran out of barbecue sauce at cookout back in 1996. Channeling what he saw his mother put into barbecue sauce in the past, he quickly cooked up a batch based on his best recollections. What came out, using only the ingredients he had on hand, was a blend of sweet, savory, and spice that gained notoriety among his friends throughout the years following as he continue to make it. More recently, Matt took the plunge into bottling the sauce, but ensuring what was being mass produced stayed true to the flavor and natural ingredients of the original. 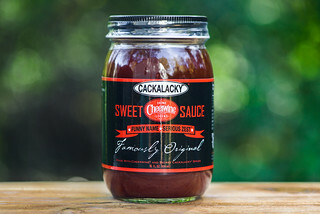 Trifecta Sweet Heat has the ubiquitous tangy tomato aroma of barbecue sauce. It's a balanced mixture between sweet tomato and vinegar, with a bit of molasses depth to it. There's a definite discernible heat that, along with the vinegar, singes the nose as a deep whiff is taken in. There's oniony notes in there too. 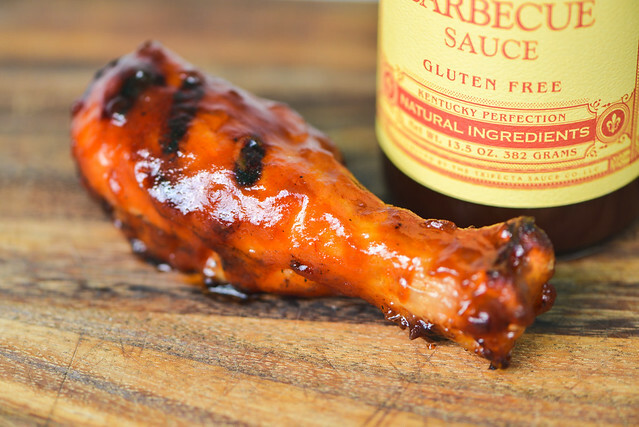 While the sauce wasn't creating anything truly unique in the aroma department, it was one of the more balanced standard barbecues sauces I've tested. This reddish-orange, semi-transparent sauce weighs in just about in the middle of the thickness scale. The smooth sauce is broken up by soft chunks of onion that gives it a bit of texture. Although I could smell the spices in the sauce, they couldn't really be seen. From a suspended spoon, the sauce falls in a couple big chunks at first, then slows to a few smaller drips, then ends leaving a light coating of sauce left clinging to the spoon. A nice sweetness starts this sauce off and it has a little molasses heft behind it to begin the flavor with depth. As the sauce settles on the tongue, vinegar begins to strike a balance with the sweetness as it ramps up. At this time, the chunks of onion become more pronounced, bringing another layer of sweetness to the party. During this whole time, there's a very bright and acidic tomato base that gives the sauce a fruity freshness. After the vinegar has reached its crescendo, the heat starts to wedge its way in. It's mild at first, but gives a hint of all the different peppers at work. There's some jalapeño flavor in there, then a hotter pepper sauce comes in and really brings the heat. By the end the spiciness is what's defining the flavor, although the sweetness and vinegar remain in play, leaving a mild mouth burn that's also sweet and tart after the sauce has made its exit. The sauce coated the chicken well and baked down nicely over indirect heat. Over direct heat, there was only mild caramelization, mostly where the sauce touched the hot grates. The flavor swung a little more to the sweet side, but it retained a lot of the vinegar tang, a bit of the onion, and a heat that was comparatively mellowed, but still pronounced. The bright and clean characteristics remained, making this an incredibly well flavored piece of chicken. Trifecta Sweet Heat won me over. My original score after testing it was an 8, but after going back to revisit it prior to writing this review, the fact that I ate a small bowl full with a spoon made me think it really deserves a 9 (that perfect 10 still remains allusive). My original dock in point was due to the fact that it didn't have a defining uniqueness like many of my top rated sauces possessed, but there's something to be said for a really great standard barbecue sauce, of which, this one is exemplary. 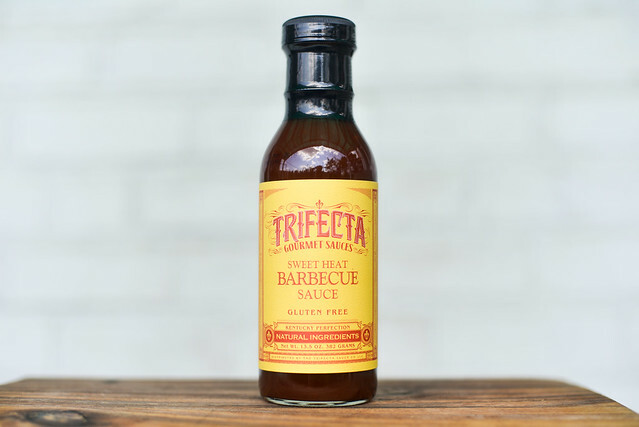 Trifecta Sweet Heat has a bright and clean flavor that shows quality ingredients matter, and then builds a great progression of layers from sweet to tangy to fruity to spicy that remain in changing good balances from start to finish. The heat is multi-faceted and just hot enough to keep a heat seeker happy, but not so much that it would turn anyone away. The soft, sweet onions are also a point worth noting here, as they were the best bits of onion or veggie I've had in any bottled sauce to date. 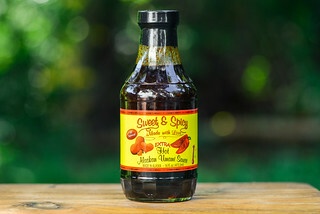 Trifecta Sweet Heat is a rare sauce that's both mild enough to work great on chicken, pork, and seafood, but also strong enough to be usable more full-flavored items like burgers and ribs. 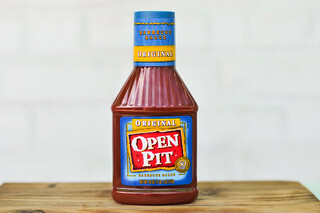 I would slather this sauce on just about anything I put on the grill.